Belleville Springs | Products | Tokyo Hatsujyo Manufacturing Co.,Ltd. If the stored energy for a unit volume of BELLEVILLE SPRINGS is compared to an equal volume of coil-less springs, it will be found to be significantly greater. Thus, although coned disc springs fit into a small space and have a small stroke, they possess a relatively large load capacity. BELLEVILLE SPRIBGS have load/deflection curves that have either linear or non-linear characteristics and these cone disc springs can be selected to fit many different requirements as related to different specific uses. 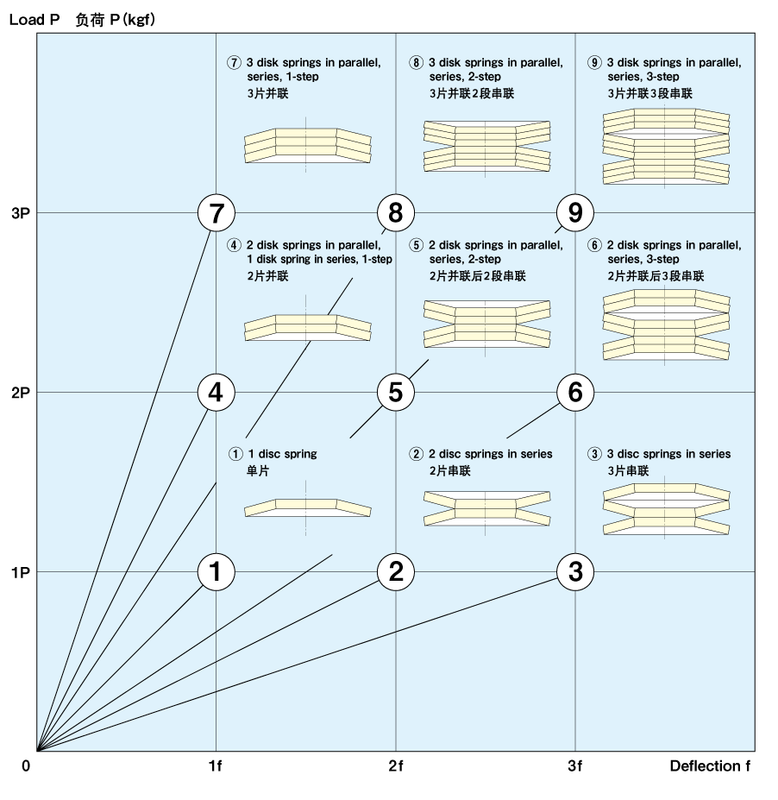 The spring characteristics can be varied, as necessary, by increasing or decreasing the number of layers of disc and using discs in series or parallel configurations, in various combinations. If they are used within their permissible stress ranges, they can endure long periods of continuous use. 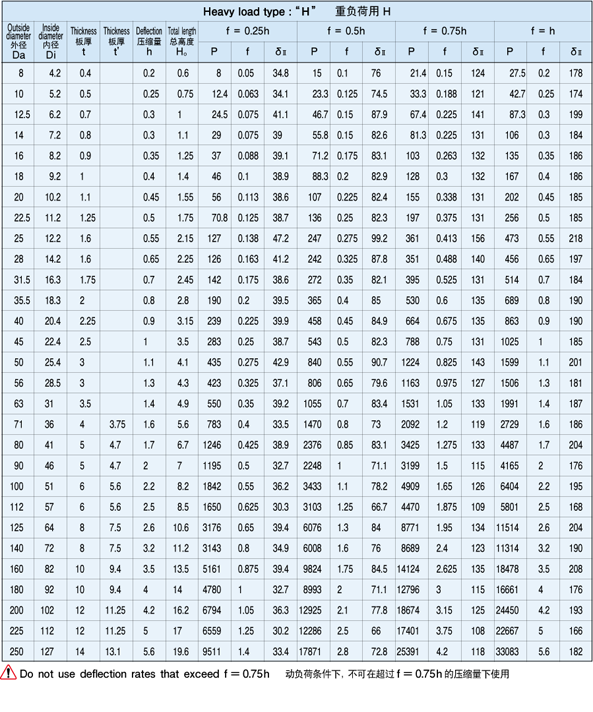 Computed values for the load tolerances of BELLEVILLE SPRINGS are indicated in the table in Figure 1. 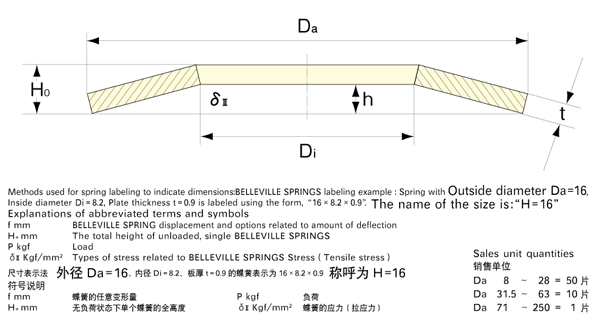 The values for BELLEVILLE SPRINGS exceeding 1mm in thickness are greater than those for BELLEVILLE SPRINGS less than 1mm in thickness. The BELLEVILLE SPRINGS that are included in the Standards Table, presuming that rated load does not fluctuate, can be used up to the deflection(f) indecated. The characteristic curve, as indicated in the graph in Figure 2, when used in situations where f=0.75h >, indicates load/deflection curve values are directly proportional and are close to the calculated values. However, when f=0.75h <, as the value approches f=h the curve changes and actual values significantly exceed the calculated values. Compared to statib loads, when The BELLEVILLE SPRINGS are used in situations involving dynamic loads, the length of their stress life becomes an important question and the frequency of such problems as spring damage and the fatigue life come to be greatly influenced by such factors as the qualities of the materials used, the heat treatment methods and the processing technology, and also by the scale of the stress caused by deflection range and differences in the number of repetitive deflection cycles. In the case of dynamic loads, if the maximum permissible deflection has been is set at =0.75h > and, for the preliminary stage deflection in order to stabilize the small shifts of the upper inside diameter edge of the BELLEVILLE SPRING of that is subject to the maximum compressive stress, at a minimum, when f=0.15h < in other words, when d 1=-60kg/mm2< preloading must be used. 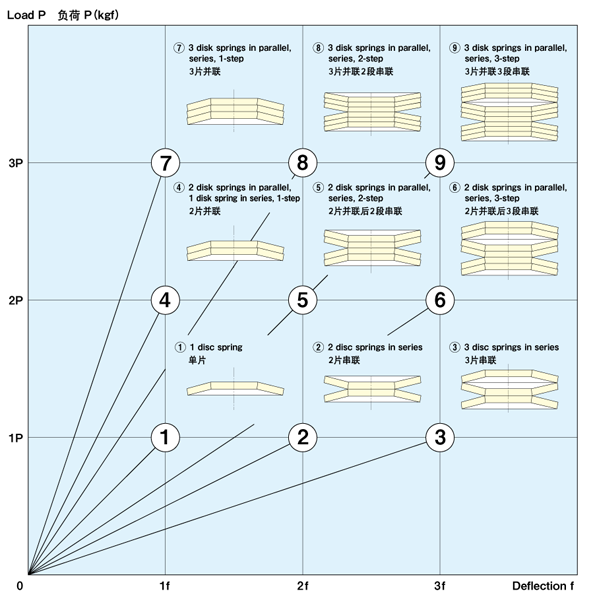 The objective of using preloaded springs is to stabilize the load and to eliminate cracks in the upper inside diameter edge. 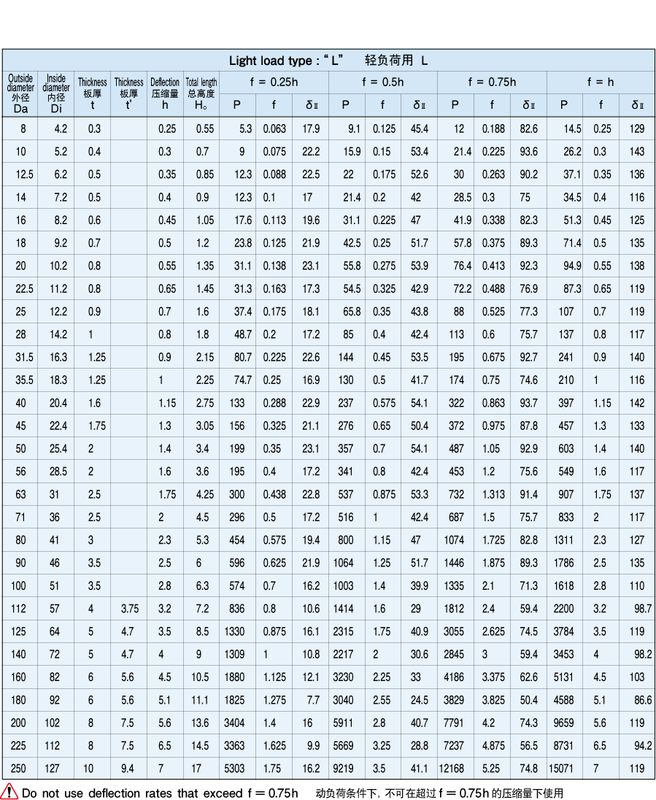 As an example, when the permissible range of the deflection is determined and the range in the number of repetitive deflection cycles is assumed to be 2 million cycles or less, the repetitive cycles stress life is as shown in the above Table. When the plate thickness is from 1mm < to over 4mm >, the total working deflection can be estimated to fall between the values indicated in the Table. If a repetitive deflection cycle life of less than 100,000 cycles is acceptable for a given application, the total working deflection is can be calculated for 1mm < at 12% and for 4mm = at 6% using the table above. When BELLEVILLE SPRINGS are stacked. 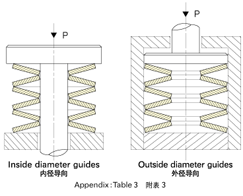 guides are used to prevent the springs from shifting position horizontally. 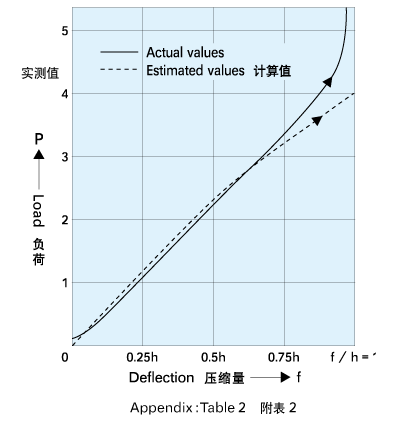 Guides also generate actual friction so that when calculating the load, this friction must be taken into account by lowing the estimation of the load. 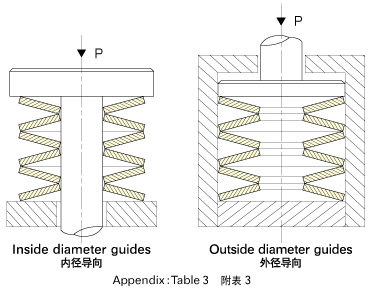 Regarding how to use guides, as is shown graphically in Figure 3, either inside diameter and outside diameter type guides can be chosen to meet design requirements. However, in actual use, outside diameter guides are the most frequently used type and provide a stable guide method. 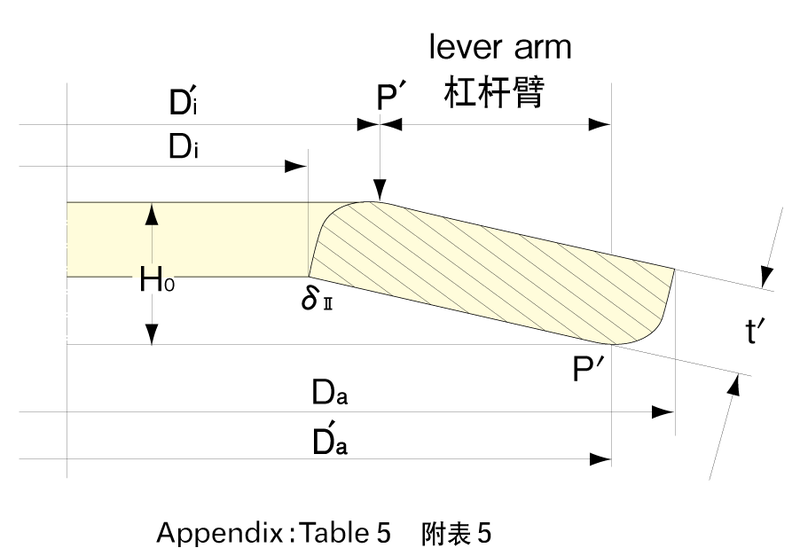 Especially in cases where guides are used in situations involving heavy loads, the guide rod must have a heat treated surface hardness of at least 45 < ~ 55 > and it is also desirable that the surface be polished. In addition, for lubrication, if molybdednum dioxide grease is applied to the surfaces of BELLEVILLE SPRINGS, this will help to effectively reduce the friction force. when BELLEVILLE SPRINGS are deflected from their free state, a slight change in the dimensions of the inside diameter will occur. Therefore, guide clearance is necessary. 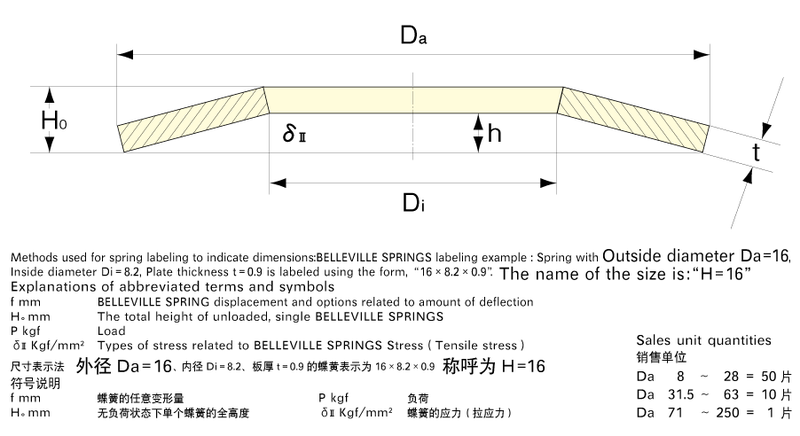 Concerning guide clearances, the standards applying to BELLEVILLE SPRINGS inside diameters, are shown by the values in Figure 4 and should be followed. 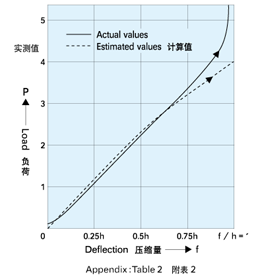 The value, L。 (Total length) when used in the case of dynamic loads, requires that the first-stage deflection should be set at f＝0.15h〜0.2h and, for the total deflection, it is desirable for that it be in the range of f＝0.75h＞.